12:30-1:30 Break for lunch. Please bring a bag lunch. 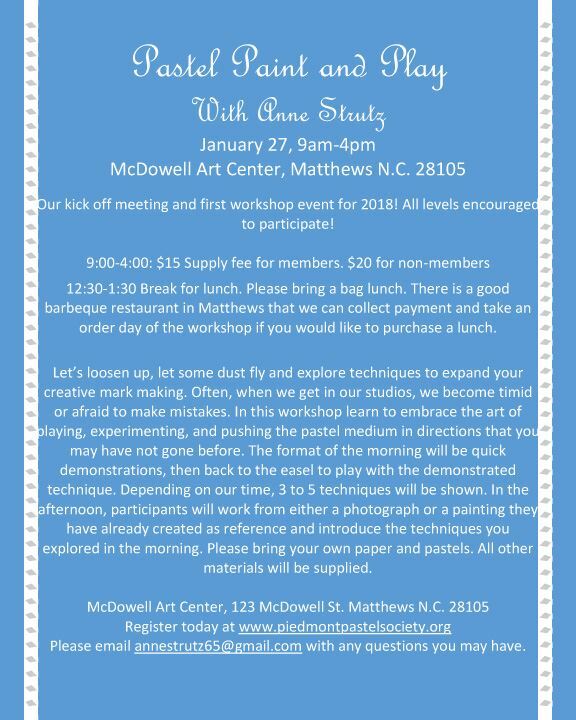 There is a good barbeque restaurant in Matthews that we can collect payment and take an order day of the workshop if you would like to purchase a lunch. Let’s loosen up, let some dust fly and explore techniques to expand your creative mark making. Often, when we get in our studios, we become timid or afraid to make mistakes. In this workshop learn to embrace the art of playing, experimenting, and pushing the pastel medium in directions that you may have not gone before. The format of the morning will be quick demonstrations, then back to the easel to play with the demonstrated technique. Depending on our time, 3 to 5 techniques will be shown. In the afternoon, participants will work from either a photograph or a painting they have already created as reference and introduce the techniques you explored in the morning. Please bring your own paper and pastels. All other materials will be supplied.